Chi and Cocchi - Remy's stuffed kitties, who were named after the graphic novel, Chi's Sweet Home. He's doing his first (tenative) 365 project, waterloguing photos of him and his stuffed animals. Since getting the iPad mini, I've been putting it through its paces, arting. So much fun! I am super-adoring the photographic post-processing I can do on the iPad. Waterlogue and Percolator remain favorites, as does the Diana app. And of course, my beloved Oggl/ Hipstamatic remains great (and the iPad version has so many more features than the Windows app). Apps are tools. Like any tool, they are useful, but mistaking a tool for creativity is a mistake. Creativity isn't dependent on tools. Creativity is how a person uses the tool. Trial and error is how I find the apps that work best for me (which is why I don't really like paying a lot for them, though I will if something really calls to me). Sometimes we make a lot of different versions before Remy finds the one he likes best. 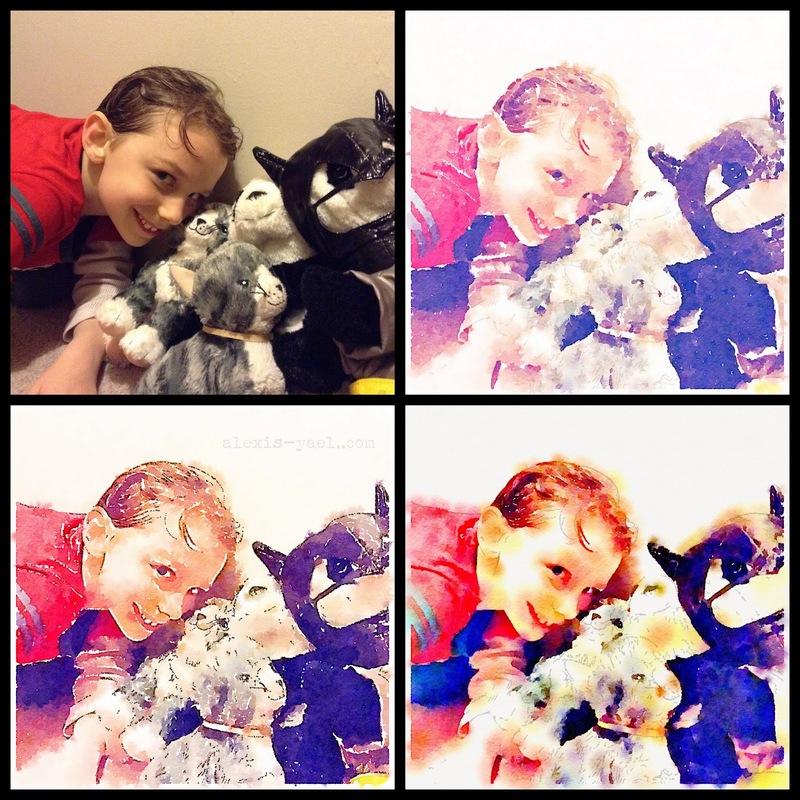 For example, the above collage, which shows three different versions of a recent #remychi365 photo. 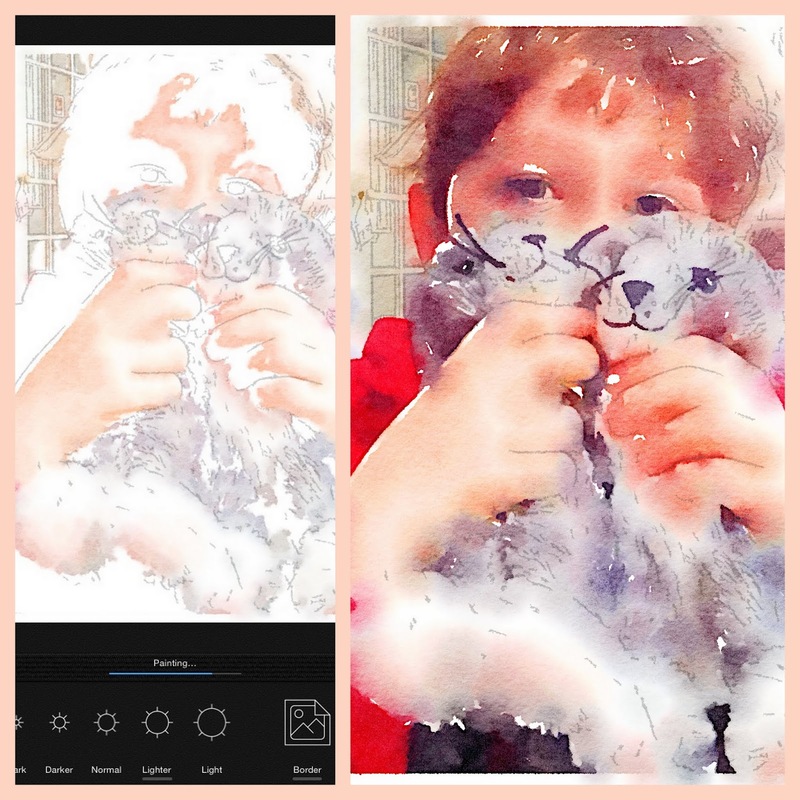 Remy loves the Waterlogue app (and taking photos of his stuffed kitties and waterloguing them) so much that he decided independently that he wanted "to take one everyday!" We've been collaborating on the project, but our approaches are very different (we're different people!) so often we each have a version of the final piece that we prefer (since it's his project, I usually only post his version. Sometimes I post my version, but I make it clear it's mine, not his). Remy loves bolder colors and broader lines. I'm happiest with softer pastels and more white space (last night I discovered I could take a screenshot during the development of the final piece and LOVED that effect, but Remy didn't care for it as much). A before-bed doodle I did last night of Chi which I then processed using Waterlogue. I'm also doodling and sketching on the iPad. I went through a few different apps until I found one that I liked best. Paper by 53 had an amazingly intuitive interface, but I found the free palate and pens to be too limited and I didn't like that there were no layers (and even buying the extras wouldn't have given me all I wanted). Moleskin's app was recommended to me, but it didn't really catch my fancy, since it was geared more towards scrapbooking. I'm sure I'll find more favorite apps as I continue to enjoy my iPad mini, but these are the ones I can heartily recommend right now. Have fun playing with them if you can!